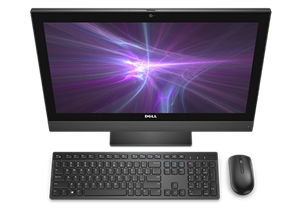 Mainstream 21.5" business All-in-One desktop with advanced manageability and security features. Everything you need, All-in-One place. Mainstream 21.5" business All-in-One desktop with advanced manageability and security features. With multiple stand options to fit the way you work. Brilliant from every angle: Witness stunning clarity from every pixel with a 21.5" Wide Viewing Angle WLED display with Full HD (1920x1080) resolution. Feel the difference: The optional ten point multi-touch screen allows you interact with your tasks, so you can pinch, drag, and swipe your way to success. Created for collaboration: Experience superb collaboration capabilities thanks to integrated speakers, a dual array microphone, and an HD web camera, along with Microsoft Skype for Business certification. Cooperation and communication capabilities for both video and telephone conferencing have never been more seamless. Work remotely, with confidence: Optional Intel® Standard Manageability technology allows for remote out of band management capabilities for increased productivity and support. The latest technology: With up to 32GB of DDR4 at 2400Mhz memory, a variety of storage solutions, including high performance solid state drives, and optional next generation AMD discrete graphics, the 5250 All-in-One delivers a powerful and efficient work experience. Less clutter, more versatility: This flexible AIO offers multiple wireless options, while streamlining all connections to one single plug for a cleaner and more functional workspace. Design your workspace: Articulating and Height Adjustable stand options allow you to alter the position your monitor for optimal comfort and productivity. Stay connected with ease: Multiple port options improve the way you work by creating an easy and centralized way to connect and share from your devices. Optional Bluetooth and 802.11ac 2x2 wireless LAN enable you to work without wires. Packed with Six USB ports, including a side USB 3.1 Gen 1 with PowerShare that conveniently charges other devices even while the system is powered down. Standard Media Card Reader SD4.0 allows for fast data transfer from a variety of memory cards. Multiple ways to display: DisplayPort and HDMI ports provide modern digital connectivity for multi-display usage so you can view more information on screen without minimizing or closing applications. Easy access: With a tool-less design, the 5250 All-in-One is easy to maintain and upgrade, maximizing return on investment. Dell OptiPlex 5250 - all-in-one - Core i5 7500 3.4 GHz - 4 GB - 500 GB - LED 21.5"